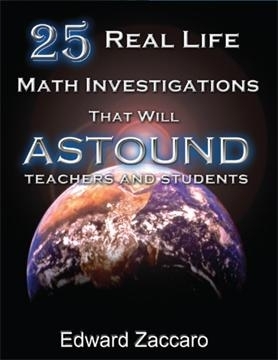 These and other fascinating math investigations will allow students to see the power of mathematics as it cuts through deception and flawed thinking to reveal the truth. I always hated math and always thought I was bad at it until I really needed a few math credits to get my Associates Degree. The professor was incredible. He made math relevant and fun and suddenly it was pretty easy. Just glancing at the graphics and the overall style of this book by Ed Zaccaro reminded me of that fun and I plan to dig through this book and learn some more. Most importantly, the book covers some key social justice issues (like rent to own) directly and through learning to look at the world through more math-savvy eyes, we can all do a better job of cutting through the nonsense sometimes tossed at us (assuming we don't get math) and shining a bright light on the truth. Combine this with "Teaching Economics As If People Mattered" and we'll have more paradigm shifts than you can imagine! Watch this space for a fuller review after I really dig into this huge book. Ed Zaccaro has taught students of all ages and abilities since graduating from Oberlin College in 1974. He holds an Iowa teaching certificate with K-12 endorsement in Gifted Education and a Masters degree in Gifted Education from the University of Northern Iowa. Ed is a popular presenter at math and gifted education conferences around the country and has approached gifted education as a parent, teacher, and school board member. His students will testify to his ability to make math fun and challenging for them as well as his unique sense of humor which comes through in his classes and workshops. We As Architects in the Wheel of Life - Is This the Mathematics We Should Be Learning?